Scrapbooking is a popular recommendation for promoting senior memory. Seniors are able to look at old photographs, recall associated events, and organize them in a chronological way that promotes memory and cognitive skills. If your loved one isn’t into arts and crafts, worry not. Memory care experts at Home Care Assistance of Harrisburg share a few other fun activities that families can encourage their loved one to try to promote overall memory. A popular game show, this game can be played at home and is great for testing and exercising a senior’s long-term memory. Start by making a playlist of a collection of songs that were popular when your senior loved one was growing up. Play short clips from some of the most popular songs and see if your loved one can write down the name of the artist and the song. After playing ten to fifteen different songs, see how many your loved one was able to name. For a more social activity, gather friends together and create teams where everyone can collaborate and reminisce. Assemble a group of seniors and have them sit in a circle. Go around the circle and give each participant an opportunity to share memories of their favorite activity or hobby from their youth. Once each person has shared their experience, go around the circle one more time. This time, each individual should recount the experience of another participant. The exercise should continue until each person has had the chance to recount the memory of another participant. At Home Care Assistance of Harrisburg, we utilize brain games that are a part of our unique Cognitive Therapeutics Method to promote memory and mental acuity in seniors of all ages so we love easy games that can be done in the comfort of home. 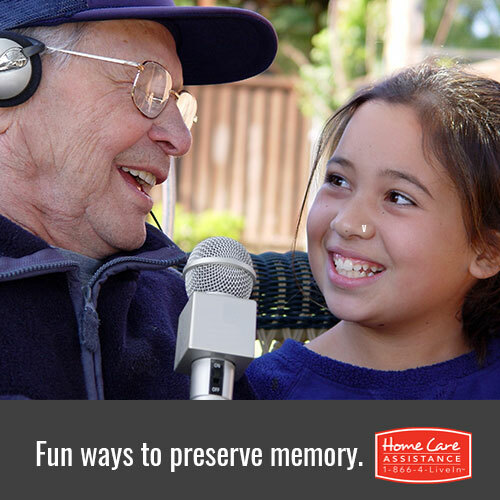 Room memorization is one that any senior and family can enjoy. Ask your senior loved one to look around a room, preferably one that they are familiar with, such as the living room. Ask them to leave the room and hide or move a few things around. Request the senior to come back and tell what is missing or what has moved. This is a great way to facilitate the brain, allowing the senior to recall both short and long-term memories. For more information about senior memory or in-home dementia care for a senior loved one who is already experiencing changes in memory and cognitive functioning, call (717) 540-4663 and schedule a complimentary, no-obligation consultation with a friendly Care Manager from Home Care Assistance of Harrisburg.